As you may or may not know, I’ve been learning to sew. It’s going slowly, but the ultimate goal is to make things I can wear. To that end, I’ve made two skirts already and they are… more or less wearable. Of course, I made both of these skirts while it was still cold, so I really haven’t had a chance to wear them except to take some cell phone pictures for this post. Still, the weather has been warming up, so I hope to wear them soon. This is the only piece of orange clothing I own. 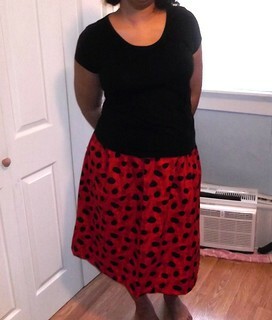 I made this skirt in a sewing class, and it’s the first article of clothing I’ve ever made. The pattern is Amy Butler’s Barcelona Skirts—the A-line version. I had to modify it slightly, adding about two inches to the hip circumference and hem. It wasn’t hard to make in class, but I’ve yet to try it again on my own, so we shall see. Also, the skirt doesn’t have any seam finishing, as doing those steps would have made the class last longer. Overall, I like the fit of it, though I wouldn’t mind more ease in the hips. Also, the skirt lacks pockets, which is a bit of a shortcoming in my book. I tried to add pockets, but I didn’t make the opening big enough for my hands—thus making the pockets utterly useless. If I do pockets in the future, I should go with a pattern that already has pockets or at least remember to make the opening (or the pockets themselves) bigger. The pockets also made sewing this a headache. I think I’d have enjoyed this project more if I hadn’t attempted the pockets. The seams are all a mess. Do not look at the inside of this skirt. I did do some simple finishes on most of the seams, though. I am beginning to understand why some people finish at least some of the seams before they actually sew them, however. I should have made the casing for the elastic waistband bigger, since I’m using a wider elastic. Hem – I should have constructed it differently, probably cutting off more and making the hemmed area smaller, as well as using the top of the hem as a guide while sewing rather than the bottom. Honestly, after finish this skirt, I felt really discouraged and unsure if I’m meant to be a sewing-type person. I’m reminded of Jack Skellington’s song after he crashes the sleigh, particularly the middle verses. 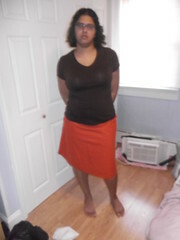 I didn’t like this skirt until I tried it on with a top. Definitely a waistband that’s not meant to be seen, but as long as the shirt is over it, it’s fine. It’s even kind of cute. I have that Barcelona pattern and have never sewn it! Now I might–I love how yours turned out. I like it, but wish it had pockets. I’m a little scared to make it on my own, though, but I plan to try later this year. YOu need to smile! Retake the pictures with a smile.! They look great! Nice outlet for creative energy. Vi: It was enough of a challenge getting the pictures in the first place. So to help with the pocket craziness…. use the pocket pattern and then cut those out. Place them on the skirt pieces (before sewing the skirt together) Sew the pockets onto the skirt (the straight edge). Then Sew the skirt pieces together going around the pockets in one long curvy line. Should make things a lot easier if you have the pockets lined up correctly. That’s what I did, but I cut the pockets the wrong size to begin with because I forgot how big my hands were. Also, I probably left too much room in the seam allowance.